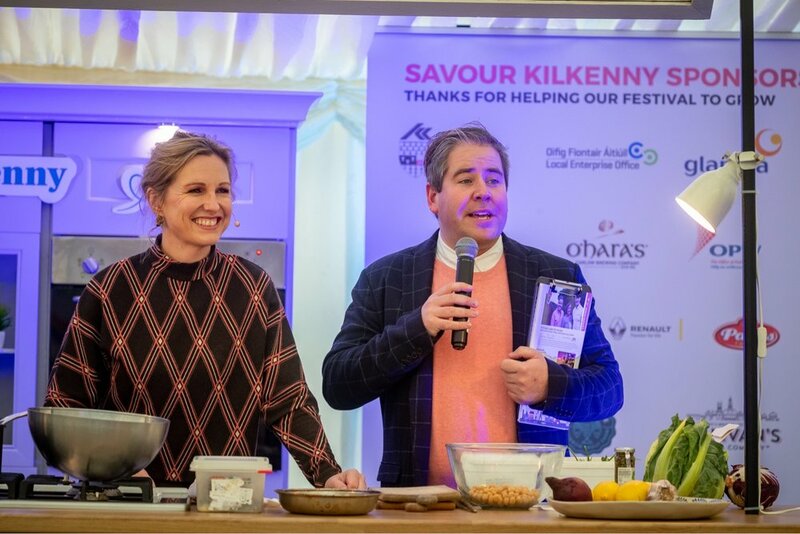 It was a pleasure to be asked to the Savour Kilkenny festival over the Bank Holiday weekend. We were invited to take to the main stage and demonstrate some of our recipes. Having done our fair share of demo gigs over the years, would you believe we have never actually cooked together in front of an audience! A first for everything and we survived it, and we really enjoyed it! There were about 200 people in the tent and the feedback on what we made seemed positive so we thought we would share a couple of the recipes here! We hope you enjoy them! These are delicious as part of a grazing Sunday lunch served with lots of salads and sides. Mix all the ingredients except the oil in a bowl by hand. If you have time, do this a couple of hours in advance to allow all the flavours come together. Roll into golf ball size spheres and flatten gently so they don't roll all over the pan. Heat the oil in a non-stick frying pan and add the lamb allowing to brown on all sides. Remove with a slotted spoon and place onto a baking tray and into a pre-heated oven 180c for about 8 minutes or cooked through - they should be sizzling! Simply mix all the ingredients together in a bowl and transfer to a serving bowl - drizzle with a little oil and any remaining herbs. Enjoy! If you liked these recipes do let us know and we will happily share! Getting into the swing of it!